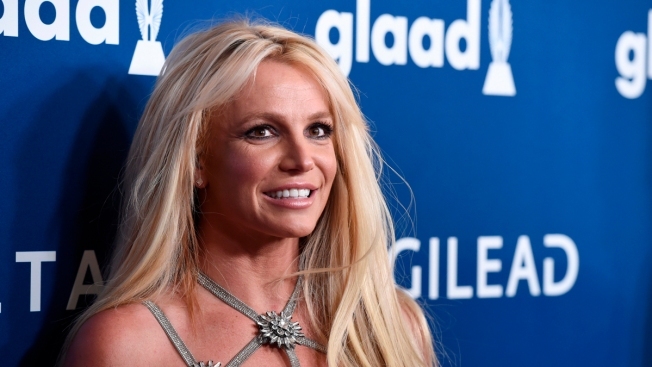 In this April 12, 2018, photo, Britney Spears arrives at the 29th annual GLAAD Media Awards at the Beverly Hilton Hotel in Beverly Hills, Calif.
Britney Spears says she's decided to focus on self-care as she goes through a rough stretch. In January, Spears announced that she was putting her planned Las Vegas residency — and the rest of her career — on hold for the sake of her father. Jimmy Fallon shows a clip from "Ew!" in which Sara and her camp BFF Abby (Britney Spears) show each other Throwback Thursday Instagram photos and play Fashion Freeze.